I’ve said it before, but I LOVE fall! Gone, well maybe not always in the Midwest, are the dog days of summer and we get to enjoy cooler weather, the changing of leaves and football! We’re always looking for ways to enjoy different activities in the fall as a family, but the challenge is to be frugal while doing so. While there are many things you can do in the fall, I’ve listed some of our favorite frugal fall activities below. Who Can Celebrate Fall Without Pumpkins? If you have kids, you know how they like to carve pumpkins before Halloween. I don’t know about where you live, but in Omaha we have a proliferation of what I like to call pumpkin amusement parks. How much does it cost to go to one of these places you ask? At $10-15 per head (including charges for the little ones), the answer may surprise you. So, after stepping foot in the place we’ve already spent $50-75 I’m hesitant to drop another $2 per pound on overpriced pumpkins that I can’t even pick myself. Added on top of that, they have all sorts of attractions and junk food that hike up the bill even higher. By the time you walk out with a pumpkin, you’ve easily spent north of $150 for a freaking pumpkin or two! I don’t think so! We’ve gotten around this by finding several local farms that let you come pick as many pumpkins as you want and get out spending under $10. Heck, you’re doing their work by paying to clear their field! Who doesn’t like to enjoy some treats during the fall? I know our family does. The problem is that if you’re trying to do so frugally you’ll not only find it a challenge, but it can be incredibly unhealthy. I mean, do you really need a caramel apple that has all sorts of junk on it and has calories equal to several meals? Well, get around that by buying your own caramel and putting it on the apples yourself. Doing this cuts the fat off your waist and adds it to your wallet. If you have any other apples leftover, then you can make your own bobbing for apples station in the backyard and have fun with the family. While I enjoy watching my alma mater on cable TV I enjoy watching football at pretty much any level. I know, it’s a sickness, but it’s a game I enjoy. If you live near a local junior high, high school or smaller college, many have football games on Thursday- Saturday nights and can be a great source of frugal entertainment. We have a high school a few blocks from our house and if it’s not too cold we’ll walk there as a family and take a thermos of hot chocolate and watch the game. The kids love it as it means they get to stay up late and I get my football fix – two birds with one stone in my book! This last one really applies if you have a lot of trees in your area. That said, we love to go for family drives and look at the leaves that have changed color. Of course, you can choose to only do that, but we like to take it a step further and either bring a meal with us or some coffee for us and hot chocolate for the kids. Not only does this provide for some frugal entertainment but we also get time together as a family too. I know there are many other activities to be enjoyed in the fall, what are some of your favorite fall pastimes? I am so growing my own pumpkins next year! They are expensive so I never decorate and it would be nice to have some on the front step next year. We want to do that ourselves next year. We just need to get around to doing it. My Dad grew them when I was growing up and it was fun to be able to use ones we grew ourselves. Football is definitely one of my favorite things to do in the Fall. If you’re into college football there are pretty much an unlimited number of games to watch. It’s funny how expensive some of those pumpkin “amusement parks” are. So much cheaper to just buy a pumpkin at a regular place! We went to a pumpkin farm yesterday and dropped $57 on a pumpkin, 2 bales of hay, dried corn for decoration, half dozen corn and a huge pot of mums ($25 but well worth it). I must admit the prices were pretty pricey for my liking but we are supporting local farmers. The pumpkin is different than what you would get at the grocery store and rang in at $8.00 which wasn’t so bad. She also suggested to cut the pumpkin into chunks and freeze it for dog treats or if our dog has an upset stomach. So, pumpkins can get pricey for the one day of fun but for the kids it’s memories. I agree it does create memories, but at $200 I think I’ll look elsewhere. We went to a local farm over the weekend and filled our trunk for $12 and our kids loved it and had a blast. We have a lot of Amish markets around here and the pumpkins are cheap. At the Amish market a big pumpkin is $4 and a medium is $2. Those same pumpkins were $7.50 at Sams Club!!! Ridiculous!! We have gone to the corn maze and Amish markets so far. Looking for a hay wagon ride now. I remember that from when I was growing up out East. It’s definitely much better than the crazy prices some places want. The apple orchard is among our favorites, although you’ve got to look around these days to find a cheap one, as their prices are on the rise too. We haven’t made kettle corn though – we’ll have to try that one! We do as well Laurie. We actually went to a good one when we were in Minnesota last year. It was a bit on the pricey side, but the apples were very good – and I HATE apples! Oh how I wish I can experience picking up different size of pumpkins! My Aunt sends us a video of huge pumpkins and some of it has different designs especially when the Halloween comes. Yea, we carve them come Halloween time. The kids love doing it and it’s cheap entertainment. They are doing a school field trip to a local farm this year, so we get the joy of the pumpkin patch, but for free! This is also the time when we switch from the mountains to the desert. We planned to go to Arches National Park this weekend, but it might still be closed. Regardless, fall is the perfect time to visit Southeast Utah. I love the warm days and cool nights. They do things like that around here and we always try to take advantage if we can. I would really love to visit that part of the country. I have only flown through Salt Lake, but never seen anything. We’re planning on driving through Utah on our way to San Diego next summer and want to catch a few sites. Let me know if you need anything as you pass through John. I live about 25 miles south of Salt Lake City. I love roasting pumpkin seeds! Pumpkins are insanely overpriced in NYC, so I usually go visit Peach in the fall because he lives near a bunch of farms. Last year the workers started laughing at me when our three pumpkins cost less than one tiny on in NYC and I asked if they had charged correctly. Living around zero nature also makes me miss the fall foliage, but Central Park is a beautiful place to stroll around in the fall. We do as well Erin. We ran into the same thing in San Diego – the prices were just crazy. I’d love to see Central Park in the fall! If we even get pumpkins this year we will just pick up a couple for cheap at Walmart. We don’t have any kids though so entertainment isn’t a factor for us. That’s my thought, though my wife always vetoes it. Here in Colorado we get a lot of gold with the Aspen trees. We have a lot of long scenic drives if you like making a day trip. Closer to home there are pumpkin and harvest festivals that I go to with my daughter. My favorite time of year too. I’ve been to Colorado in the fall and it’s just beautiful. I imagine it would make for a good scenic drive. Last fall, we went apple picking…I think it was $25 for a bag or something…we packed that bag full! The pumpkin we bought there wasn’t too expensive, though I don’t remember the price. The drive up there also included lovely fall foliage which was pretty cool. It can get pricey, though $25 isn’t too bad for apples. I think we paid around that last year. Nothing changes too much around these parts except for maybe cooler mornings and evening, but I do enjoy the beach a bit more because it’s more peaceful and relaxed with less people. I do love to carve pumpkins and my neighborhood gets a lot of kids for Halloween so I love to pass out candy. I also like to make cheaper soups which last a long time now the my kitchen doesn’t get too hot. I enjoyed the same thing when we lived in San Diego Tonya. There were a lot less people at times, which made it much more enjoyable. My kids love playing in the leaves! We just rake a giant pile and they’ll play for hours! This is why I’d love to visit the northeast sometime during the fall. The fall color tour would be spectacular. I’ve wanted to do the same thing Joe, I do think it would be nice. Perhaps when our kids get older. I’m a huge fan of fall cooking. I might bake something once or twice for an extra indulgence, but to keep it more healthy I stick to the squashes and soups- leaving out the cream as much as possible. I’m excited for the leaves to change. The last few days have been in the 70s here, summer seems to be holding on for dear life. Hopefully, by the time I go upstate in two weeks, it’ll cool down and we’ll have some beautiful colors. We do a lot of that as well Stefanie. We’ve been pulling a lot of stuff out of the garden the last few weeks, which goes perfect with making different stews/soups. Then we freeze the rest and it lasts that much longer. Awesome ideas! I completely agree with you on the pumpkin patches – skip ’em! There are lots of places – farms, as you said, and I’ve seen churches and schools, too – that sell pumpkins as a sort of fundraiser. You only have to pay for your pumpkin, no admission fees. Around us there are also a lot of festivals and orchards and farms that are free to get into, which definitely helps the overall price of an outing. I’m happy to grab some apple bread or apple cider donuts, or go to a corn maze for a couple bucks, when I don’t have to pay at the door on top of everything else. I agree Kali, there are generally plenty of options out there in the case you don’t want to take out a second mortgage to buy a pumpkin. I love Fall. The weather is perfect and it is so pretty. We plan on doing a lot of outdoor activities! Yikes, that is a lot for a pumpkin amusement park! We have those around here too, but we just found a local farm near our new house to purchase pumpkins on the cheap. One of my favorite fall activities is free. We live near the mountains, so we love to go for hikes and see all of the beautiful fall colors. Whoa, that’s expensive. I don’t know any pumpkin farm around here. I’ll have to do some research and find a $10 pumpkin. At least we have a bunch of small pumpkins in our garden so that’s cool. I agree, it’s crazy. I felt like I had to take a second mortgage to buy one, Lol. I’ve never really had a taste for pumkins but I think doing the DIY treats is a perfect idea. Making cookies is very affordable. You can probably get alot of the baking supplies like cookie cutters etc. from the dollar store. Totally Romona, the dollar store is the place to go for stuff like that. My wife and I love to go up to the mountains to watch the leaves turn and just enjoy the mountain air. That might not be possible with the government shut down this year though. We don’t buy pumpkins and never have, so we don’t worry about that. It’s sad how the shenanigans in DC impacts things like that, isn’t it? A monthly networking event we go to is canceled on Friday for the same reason. Fall definitely equates to football (both college and NFL) with B. It’s the only time he gets really sociable, though, so I’m all for it. 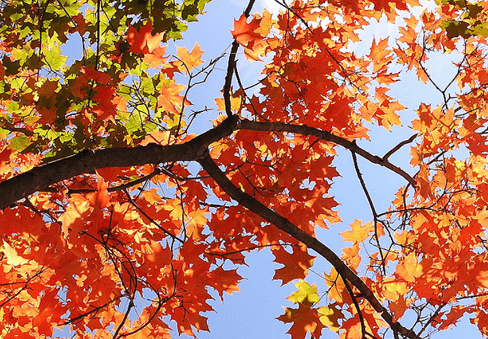 I’m so envious of areas that see leaves color changing – hope you enjoy! As it does for me Anna. 🙂 I could watch it all weekend if my wife allowed me. 😉 Yes, I missed that as well when I lived in San Diego. I do love Pumpkin Pie though and the change in Nature’s color is absolutely spectacular in some parts of my ‘hood! I also love the climate and the fact that I can add layered clothing if I am too hot or too cold. As much as I love summer, I can’t stand the heat and humidity. Thanks Lyle! Yea, the pumpkin theme park is just not for us. Way too much money if you ask me. Fall is my favorite season. This weekend bf and I are going to storage to get the rest of our Halloween and Thanksgiving decorations. We’re also going to buy our pumpkins and hopefully some cider. Buying a groupon is the way to go with stuff like this and the little ones do love it! Fall is a really beautiful time of year. I love watching the leaves turn too. It still doesn’t feel like October yet, but I’m starting to get into the Halloween spirit with decorations popping up all over the place. Makes me want to eat some pumpkin bread. Someone got snippy with me when I said that I got my pumpkin from Walmart. It was $3.88. In NYC I would regularly spend $15-$20 for a pumpkin at the pumpkin patch. I woke up this year. You can’t beat $3.88 Sandy. That’s not bad at all. I remember when we lived in San Diego and we’d have to pay in the neighborhood of $15 per pumpkin and that was 10 years ago! I love going for walks in the fall amongst the pretty colorful trees. It’s one of my favorite things to do and completely free. I always just get my pumpkins at local grocery stores – they are usually fairly cheap. Why spend more than you have to? Exactly Daisy. It’s silly to pay more than you need to. We like taking walks in the fall as well, especially as it gets cooler and the leaves are changing. We’ll be doing that soon ourselves as well. The kids love it!